Our very active 10 month old grandson loves his new chair. We love the size, durability and how easy it is to clean. Extremely satisfied with this purchase. Badger Baskets Envee II Baby High Chair easily converts back and forth from a fully-featured baby feeding station to a separate play table and chair for your toddler and preschooler! Includes two trays, a comfy seat pad, 5-point seat harness. It also has a three-position tray and three-position seat recline. For use from approximately six months (when your child can sit unassisted) and up in the highchair. For use from approximately 2 years to approximately 6 years (40 pounds/18 kg) when converted to a play table and chair (maximum ages vary depending on the child's size/weight and activity level). 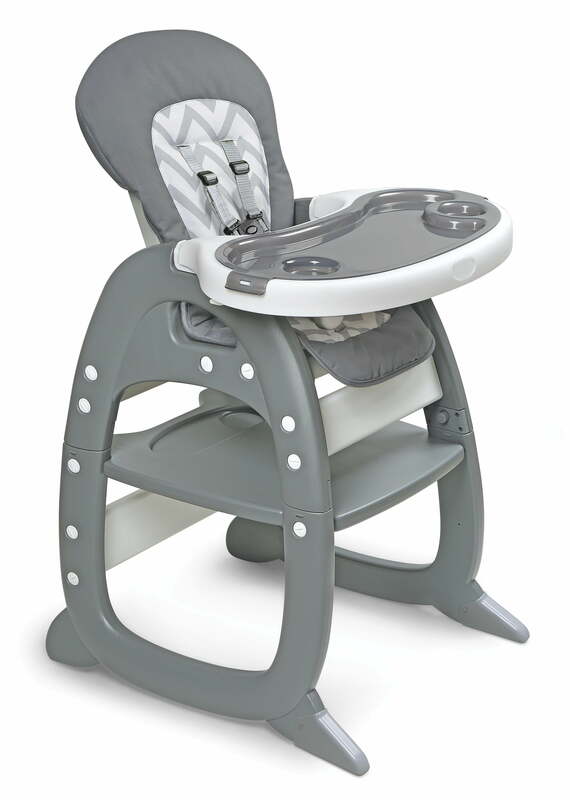 Tbook.com crawls the web to find the best prices and availability on High Chairs and related Baby Items products like Badger Basket Envee II Baby High Chair with Playtable Conversion, Gray Chevron. For this page, related items include products we find that match the following keywords: "High Chair" at our vendor partner Walmart. Badger Basket Envee II Baby High Chair with Playtable Conversion, Gray Chevron is one of 136 High Chairs and related products listed in the Baby Items section of Tbook.com If you have any questions on this product, please give us a call at 734-971-1210 during the hours of 9am - 5pm EST for assistance. Thank you for shopping at Tbook.com, the Internet Department Store!